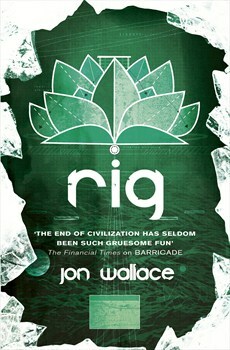 Jon Wallace returns to his dark post-robopocalyptic world for a third and possibly final time in Rig. This volume takes readers off England’s blighted shores and into the wider world, starting off the coast of a post-nuclear Florida. Once again, Kenstibec, the Ficial (android) who, since losing his nanotech has become increasingly Real (human) is at the centre of a narrative that jumps between his current dire circumstances to his earliest days just off the Ficial production line. Rig is immediately different to its two predecessors, Barricade (reviewed here) and Steeple (reviewed here). The earlier novels were based broadly around a quest. Barricade was an unnerving road trip across a blasted Britain, while Steeple had Kensitbec on a mission, although one in which he had motives of his own. Rig is less straight forward and, as a result, it takes a little longer for the plot to kick in. But there is plenty to catch up on in the meantime, including characters from both the first and second books who have ended up on the strange Ficial-made, lotus-like floating crèche that Kenstibec has also found himself living on when the book opens. In Barricade, Wallace made readers care about Kenstibec even when he was essentially a killing machine. In Rig, Kenstibec continues his journey towards personhood. Kenstibec can now identify how Reals think and operate even as he decides not to act like them. But he is becoming more human – as the book opens he is still very attached to his dog, Pistol, and has an unrequited fascination with a human, connections that start to influence his actions. The flashbacks, which have gone further back in time in each volume, recount how the Ficials’ creators strove to wipe any aspect of humanity from their creations. Wallace uses Kenstibec and this post-robopocalyptic world as a warped funhouse mirror in which to reflect current issues. In Rig this includes a theme park turned into a slave market, a bizarre organised religion and a violent sport used as a tool to control the masses. And while the previous books went to some dark places, Wallace even manages to outdo himself in the ick factor. There are no easy choices and no easy answers as the pressure mounts but Wallace never loses sight of the basic humanity of his main characters, making readers care about them as they face tougher and tougher odds. In each book in this series, Wallace has managed to expand his world, embed social commentary and has seen his main character grow in ways that even surprise himself. Rig is no different. And if this is going to be the final book in the series, then Wallace has gone out on a high.